Two gardaí have saved the life of a young person who went into a fast-flowing river swollen with water after heavy rains. Gardaí Ronan Doherty (25) and Ashley McEvoy (34), from Dundalk garda station, Co Louth, also put the casualty in their Garda van and drove to meet the ambulance that was en route as they were concerned about hypothermia. Gda McEvoy said they were alerted after a call from the public last Thursday that, "a young person had entered the Castletown river". They realised the flow of the water would have moved the person down river and began their search there. "It was pretty fast flowing and pretty deep," said Gda McEvoy. A short time later, Gda Doherty saw what he thought was a piece of clothing. "I saw the young person in the water holding onto a tree. The water was up pretty high," he said. "I got my baton out and extended it and reached it out and the person was able to grab a hold of it." Gda Doherty reached over to grab their hands. "The river was flowing fairly fast and we were worried if they lost grip they would have gone with the current," he said. Both gardaí then pulled the casualty out of the water. They were concerned about hypothermia so they put them in their Garda van and drove to meet the ambulance which was coming from Drogheda. 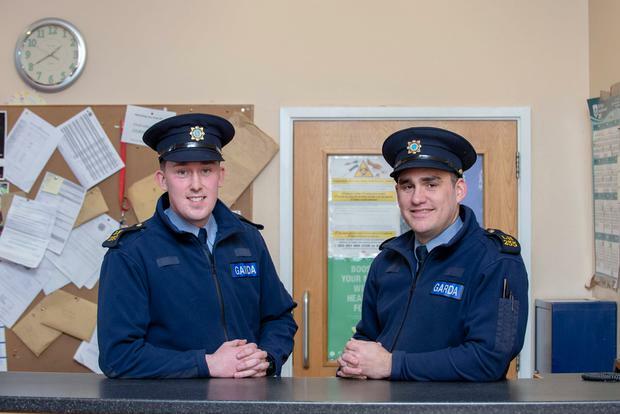 Sgt Errol Boyle paid tribute to the two gardaí, saying: "They were fast-thinking on the day. But for the actions of both gardaí this young person could have lost their life. I saw the currents and they would definitely have otherwise been swept out to sea."